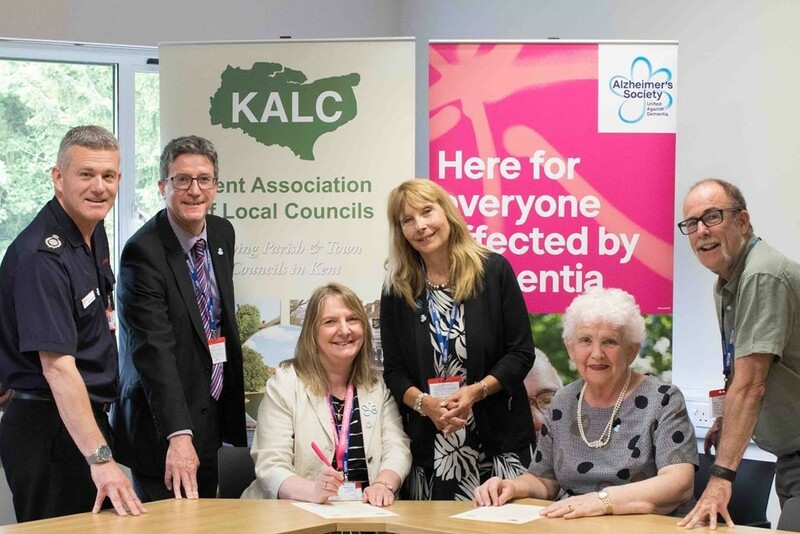 The Kent Association of Local Councils (KALC) has joined up with the Alzheimer’s Society and Kent Fire and Rescue Service to help local communities across the county combat dementia in their local areas. KALC’s signing of the strategic commitment on dementia complements the National Association of Local Council’s (NALC) own strategic commitment, which was signed at last year’s Annual Conference by Cllr Sue Baxter, chairman of NALC and Angela Rippon, Alzheimer’s Society Ambassador and co-chair for the Prime Minister’s Champion Group on Dementia Friendly Communities. work with the Alzheimer’s Society and other recognised experts to share best practice and publicise effective policies, procedures, practices and training. Jackie Swapp, Alzheimer’s Society operations manager for Kent and Medway said: “It is great to hear of the positive work happening in Kent, with KALC and Kent Fire and Rescue Service. This Dementia Action Week (21–27 May 2018), we are calling on everyone to unite and take actions, big or small, to improve the everyday lives of people affected by dementia. “In the UK, one person develops dementia every three minutes and there are 23,921 people in Kent and Medway living with dementia. Almost everyone knows someone whose life has been affected. Yet too many people face the condition alone, without adequate support.